IFA 2018: Samsung reveals Q900R 8K QLED TV range with 8K AI upscaling | What Hi-Fi? After almost a year of teasing and speculation, Samsung has finally announced details of its first 8K TVs. During its press conference at IFA 2018 this morning, Samsung unveiled its four-strong Q900R QLED 8K range, due in the UK in mid-October. 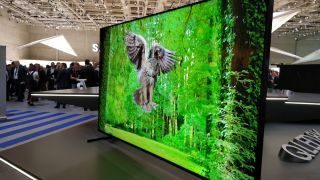 They are set to become the first TVs with 8K resolution available in the UK market. The ‘8K revolution’ (as dubbed by Samsung’s spokesperson) will be led by 65in and above screen sizes. Samsung expects sales of 75in TVs to double by 2020, and that end, the Q900R range comprises 65in, 75in, 82in and 85in variants. At the heart of the Korean giant’s Q900R QLED 8K range is 8K AI upscaling. As we learnt at CES earlier this year, the 8K TVs (with a 7680 x 4320 resolution - four times that of a 4K panel) have an intelligent upscaling algorithm that can upscale 4K, Full HD and even SD content to “quality nearly the equivalent of 8K resolution”, improving detail and depth while reducing noise and motion issues – whether it’s from a streaming service, set-top box, HDMI, USB or even mobile mirroring. Unlike conventional sets that use filters for smoothing, and detail enhancement and restoration processing for greater perceived detail, Samsung’s 8K AI upscaler technology (delivered by the company's proprietary Quantum Processor 8K) is based on ‘machine learning’ and can cleverly learn (and store in its database) what processing tools to use depending on the content type. Resolution and upscaling aside, the four TVs have a 4000-nit peak brightness delivered by ‘Direct Full Array Elite’ backlighting. They have also been certified with 100 per cent colour volume capability. Audio also falls under the TVs’ AI upscaling technology. A sound optimization feature aims to enhance audio performance depending on content type by identifying the content’s metadata and continually analyzing and rendering the sound signal accordingly. For example, during a football match, crowd noise will be amplified after a goal. Samsung has also worked on improving the user experience. The Q900R TVs have been designed to identify a number of devices connected to them and automatically adapt their picture and audio output accordingly to 'optimum' settings. Like Samsung’s The Frame, they also incorporate ‘lifestyle’ features such as Ambient Mode, which can display art in a low power mode when the TV is not in use. Samsung has so far kept hushed about pricing, but naturally we can expect asking prices north of £5000, to surpass those of its flagship 4K QLED models.